Saturn can be found 3 degrees to the lower left of the waxing crescent moon in the southwestern sky on Sept. 26, 2017, making a nice sight in binoculars. This sky map shows where Saturn and the moon will appear at 8:30 p.m. local time in mid-northern latitudes. If the weather is clear in your area on Tuesday evening (Sept. 26), you’ll have an opportunity to see what probably are the two "most asked for" objects to look at through a telescope: the moon and Saturn. About an hour after sunset, roughly one-quarter of the way up in the south-southwest sky, you’ll see the moon, a little over a day from reaching first quarter, 40 percent illuminated by the sun. And if you look about 3 degrees (about the width of your outstretched thumb) below the moon, you’ll see a bright "star" shining with a steady, yellow-white glow. Except that’s not a star, it's the ringed wonder of the solar system: the planet Saturn. The moon itself is a wonderful object to look at through binoculars or a telescope. Check the region right along the day/night line (called the terminator) on Tuesday, and you will see a region strewn with craters — especially to the south — some partially in shadow and all standing out in sharp relief on the lunar surface. Up near the top of the moon, immediately adjacent to the terminator and in full sunlight, are two prominent craters you can’t miss. The smaller and lower of the two is Eudoxus, 41 miles (67 km) wide and 2.1 miles (3.4 km) deep. The other is Aristoteles, 54 miles (87 km) in diameter and 2 miles (3.3 km) deep. Both are notable for their unusually massive walls. Saturn will set just before 10:30 p.m. local daylight time and the moon about a half hour later, or about 4 hours after sunset. Without question, Saturn is a showpiece of the night sky. The famous rings can be glimpsed with a magnification of 30-power or higher, and currently they are easy to view because they are tilted nearly 27 degrees to our line of sight. The rings consist of billions of particles ranging in size from dust motes to chunks that are up to about 30 feet across (9 meters). These particles are made of or covered by water ice. The ancients regarded Saturn as the "highest" planet, occupying the outermost or highest sphere before that of the fixed stars. Finally, when you look up at the sky on Tuesday, don’t forget to also look for Antares, the so-called "rival of Mars," which sits about a dozen degrees to the lower right of Saturn. 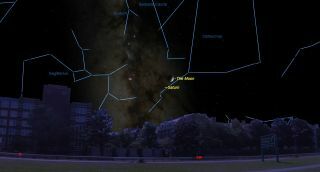 (Check this guide to learn more about how to measure distances on the night sky.) On Wednesday evening, Saturn will lie almost midway between the moon (far to the moon's upper left) and Antares (well down to the star's lower right). Antares is a supergiant star, which glows a very distinct red color, much more so than yellow-orange Mars. That’s why Antares is Mars’ rival, regardless of whether it’s dimmer or brighter than the planet. Antares in Greek literally means "anti-Ares." Ares was the Greek equivalent of the Roman moniker, Mars. Joe Rao serves as an instructor and guest lecturer at New York's Hayden Planetarium. He writes about astronomy for Natural History magazine, the Farmer's Almanac and other publications, and he is also an on-camera meteorologist for Verizon Fios1 News, based in Rye Brook, NY. Follow us @Spacedotcom, Facebook and Google+. Original article on Space.com.